Bee's Circus: 674. Halloween Cheesecake, two of my favourite words. 674. Halloween Cheesecake, two of my favourite words. We had a little Halloween party this afternoon, with some of Daniel's friends from school. It was adorable, everyone running riot, playing pass the parcel & musical statues, and having a disco party with glow sticks! I made some super cute food, including this delicious cheesecake, the recipe is from Ella's Kitchen's Cookbook, which is definitely on my Christmas list!! Happy Hump Day & Halloween Eve! This is definitely among Ella’s favourite dessert of all time – it’s a delicious sweet treat without any added sugar. Enjoy it when you have friends to tea. • Line the base of a 20 cm/8 inch loose-based cake tin with baking parchment. Put the hazelnuts and oatcakes in a food processor and blitz them for a few seconds until everything is finely chopped and looks like breadcrumbs. Add the dates and blitz again until the mixture is soft. Add the melted butter; mix well and press the mixture into the tin with the back of a spoon. Chill this in the fridge for 15 minutes. • Meanwhile, make the topping. In a bowl mix together the cream cheese, vanilla extract and three-quarters of the puréed strawberries. • Whisk the cream until it is stiff, but still soft. Fold it gently into the cream cheese mixture. Remove the base from the fridge and spoon over the topping. 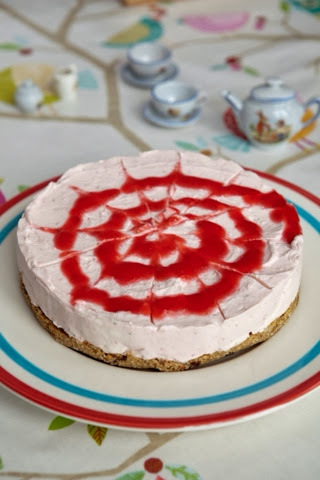 Try out your tot’s artistic talents by asking him or her to have a go at making the swirly whirly marbling pattern on the top of the cheesecake. You can sidestep making the strawberry purée by substituting 2 x 90g/3 ¼ oz pouches of Ella’s Kitchen Smoothie Fruits – The Red One.